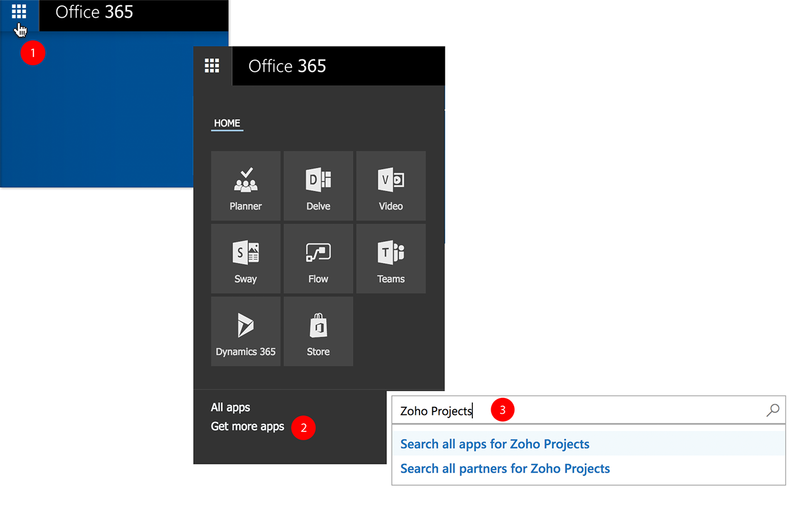 Import your Office 365 users to Zoho Projects with the Office 365 integration. 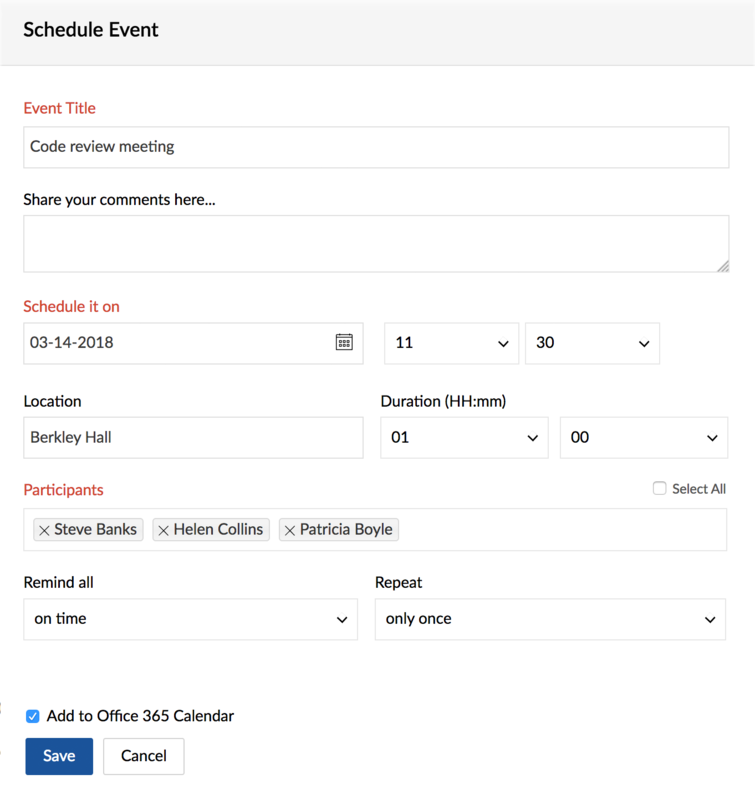 You can add tasks and events to your primary calendar in Office 365 from Zoho Projects. Log in to your Office account. Search for Zoho Projects in the Apps section. When you click the Zoho Projects app, you will be asked to create a new Zoho Projects portal(account) if you don't have one. If you already have a Zoho Projects account with the same email address that you use for Office 365, you will directly be taken to that account. You can access Zoho Projects now. Select in the upper-right corner of the top navigation bar. Navigate to Integration > Other Apps > Office 365. Select the Office users whom you would like to import. You can map them to one or more projects by selecting the project names from the Select Projects dropdown. If you choose to skip this step, the users will be added to the portal (common for all projects) and you can map them later. You can also update the role and profile of the selected users before importing. 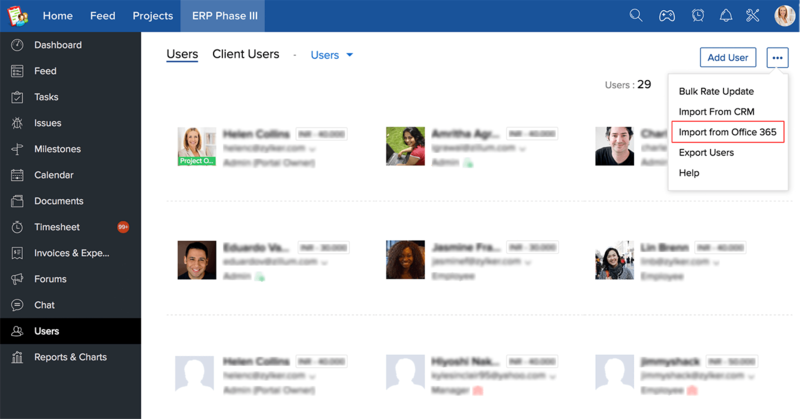 Navigate to your project and click Users in the left panel. Click Import from Office 365. You can enable or disable the Outlook action cards that are sent along with the task or issue email notifications from Zoho Projects. 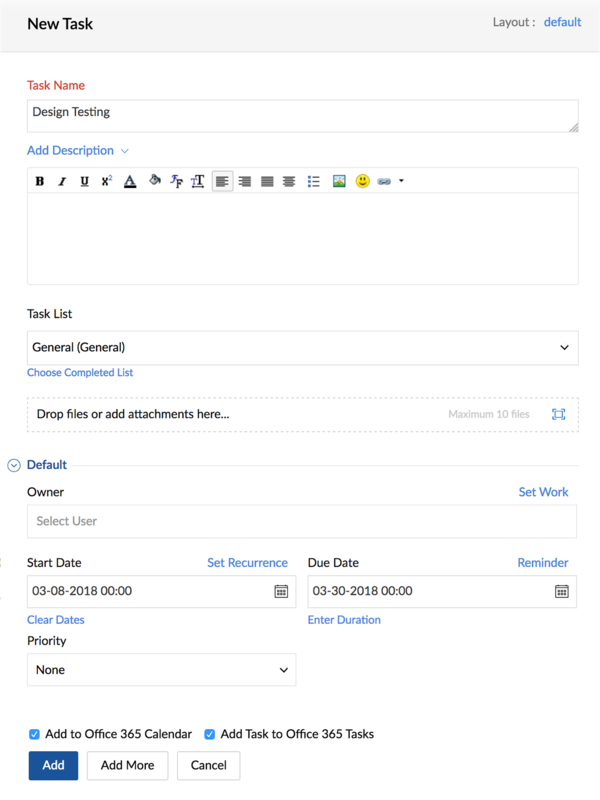 With action cards, the portal users can perform instant actions like assigning work items, setting due dates and modifying their priority, right from their Outlook mailbox. In the Manage Action Cards tab, you can toggle the switch to enable or disable action cards. If you disable this option, email notifications sent from Zoho Projects will not have actionable cards. Click Add Task in the upper-right corner of the page. Enable the Add to Office 365 Calendar option to add the task to your calendar. Enable the Add Task to Office 365 Tasks option to add it to your tasks. Navigate to your project and click Calendar in the left panel. Click the Events tab at the top. Click Schedule Event in the upper-right corner. Set reminders or add a recurrence for the event. Enable the Add to Office 365 Calendar option.